Part 1 Understanding the effects of processing on the properties of metals: The behaviour of metals during high-temperature processing; Thermodynamic aspects of metals processing; Phase diagrams, phase transformations, and the prediction of metal properties; Measurement and estimation of physical properties of metals at high temperatures; Transport phenomena and metals properties; Interfacial phenomena, metals processing, and properties; The kinetics of metallurgical reactions in metals processing; Thermoanalytical methods in metals processing. Part 2 Improving process and product quality: Improving process design in steel-making; Solidification and steel casting; Analysing metal working processes; Understanding and improving powder metallurgical processes; Improving steel-making and steel properties. As product specifications become more demanding, manufacturers require steel with ever more specific functional properties. As a result, there has been a wealth of research on how those properties emerge during steelmaking. Fundamentals of metallurgy summarises this research and its implications for manufacturers. 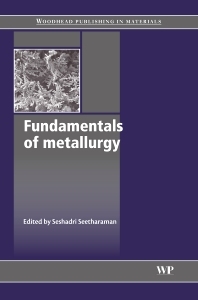 The first part of the book reviews the effects of processing on the properties of metals with a range of chapters on such phenomena as phase transformations, types of kinetic reaction, transport and interfacial phenomena. Authors discuss how these processes and the resulting properties of metals can be modelled and predicted. Part two discusses the implications of this research for improving steelmaking and steel properties. With its distinguished editor and international team of contributors, Fundamentals of metallurgy is an invaluable reference for steelmakers and manufacturers requiring high-performance steels in such areas as automotive and aerospace engineering. It will also be useful for those dealing with non-ferrous metals and alloys, material designers for functional materials, environmentalists and above all, high technology industries designing processes towards materials with tailored properties. Seshadri Seetharaman is Professor of Materials Process Science at the prestigious Royal Institute of Technology in Stockholm, Sweden. Professor Seetharaman has an international reputation in metallurgy research.